The Central Ontario Railway began its operations as a line from Picton to Trenton in 1879, under the name "Prince Edward County Railway". Two years later, under the new name "Central Ontario Railway", multiple expansions were undertaken to reach the developing mineral laden northlands. By 1882, the rails, laid through fields, swamps and rock cuts, had reached Marmora, mile 30.4, with a station established by July 1883. By 1884 the line had reached Coe Hill, and on Nov. 7, 1907 the extension to Bancroft was completed. The intention was to connect with the Canada Atlantic Railway (which later became part of the Grand Trunk Railway) at Whitney, but the track never made it that far, with construction ending only eight miles away. While the railway serviced the mining industry, it was well used by farmers, the lumber industry and passengers. It was well built with cement bridges and tiled water courses, and a grade that never exceeded one per cent. The line finally stretched over 110 miles from Wallace, north of Lake St. Peter to Weller’s Bay, where schooners waited at a great pier to shhip ore to the United States. Branch lines went to many communities, including Picton, Coe Hill and Deloro. Eventually the C.O.R. was assumed into the Canadian Northern in 1912, and later became part of the Canadian National Railway. This line was abandoned in 1965, and now, as the Hastings Heritage Trail, it forms a recreational corridor. Marmora's station, located on the Hastings Heritage Trail and Station Road, was named Wolfe Station after the Richard Wolfe, said to have been murdered there. It's history included passenger rail service, lumber cargo and transport services for Deloro Smelting and Refining Co. In 1910, according to the schedule below, trains passed twice a day through Marmora, giving people enough time to arrive in town, visit the doctor, do some shopping and return to the outer areas. Every train was greeted by teamsters looking for business and local looking for excitement. They knew the importance of the railway to their community. Pictured above is Grace Warren awaiting a train that was to pick her up, along with $260,000.00 worth of silver Bullion from Deloro in July of 1912.
incorporated in 1858 to service the Marmora Mines was one of the many imagined projects that never got off the ground during the "railroad fever" of the 1850's. CLICK HERE to read the 1858 arguments presented to the public by the directors which included Solomon Johns, Reeve of Marmora. For the full engineer's report with all the details, click here. In 1865, Warden Billa Flint gives notice of another application for the Belleville-Marmora Railroad. It was not until 1882 that a rail line reached Marmora, built by the Central Ontario Railway. For those who missed the train, the O'Connor House was available right across the street from the station. Above: The O'Connor Hotel, 1911 Below: Photos indicating the position of the warehouse built later. Just north of the warehouse was a wooden watertower, used for refuelling the steam engines. "A spur line is being surveyed from Marmora Station to C.O. Railway to Deloro. A road will be built on which to ship ore and coal." Marmora Station narrowly escaped being destroyed by fire last Thursday evening as a result of the C.N.R. telegraph wires becoming heavily charged from the Hydro-Electric line. Mr. Ed O'Connor discovered the fire before it had made much headway and telephoned Mr. Bell who hurried to the station and with a number of men soon had the fire under control. The stations at Eldorado and Anson also caught fire from the same cause but damage was slight. From 1901 to 1936 Mr. D.E. Bell was the station agent for the Marmora CNR statio. In 1936 he waswas transferred to Peterborough. A 1936 article re- fers to the fact that, "While to the casual observer, Marmora Station may have appeared comparatively unimportant, it has been one of the most profitable stations, outside of the larger towns or cities, on the system, owing to Deloro Smelting and Refining Company Limited." In 1973, the station was the scene of a spectacular derailment when two diesel locomotives pulling two box cars were heading north toward Bancroft. The January 3 write-up of the incident, in which no injuries occurred, mentions, "Apparently, the front trucks of the lead diesel jumped the rails at the crossing on the Madoc Pond. The engines travelled north of the station about 100 yards when the derailed wheels hit the siding rails and the lead engine headed off the main line, The second engine and two cars stayed on the main line and shoved the lead diesel down over the bank into the swamp smashing in the side and rupturing the fuel tanks. It is thought that because of the very bad weather on the weekend, frozen ice in the crossing may have been a contributing actor in the.derailment." 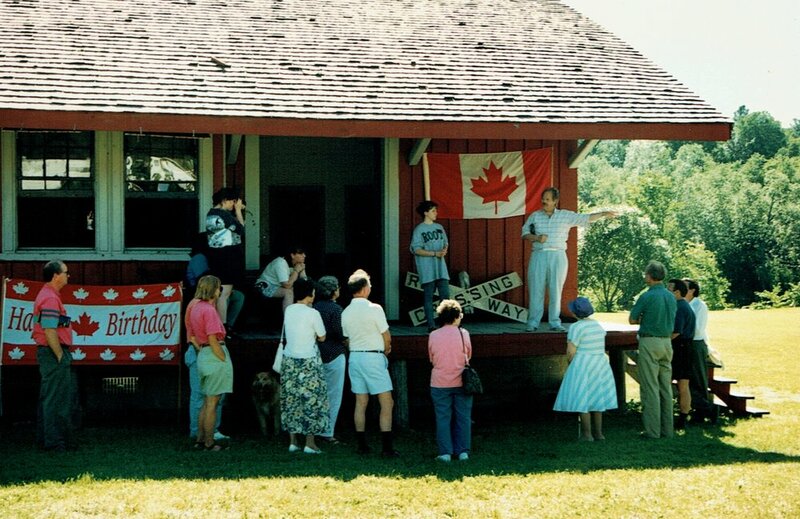 In 1985, when the station was 101 years old, the Marmora Historical Foundation took over possession of the station to work on its preservation. 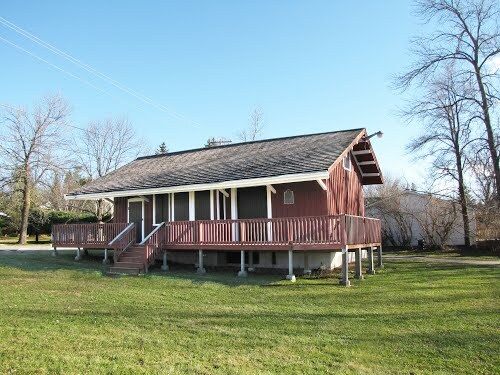 The project was headed by Bob Sanderson, and was aided by Reverand West of Belmont Township who transported the building to the Memorial Park in town to a location in front of the Dr. Parkin Living Centre, where once passed another railway - the CN spur line to Cordova. 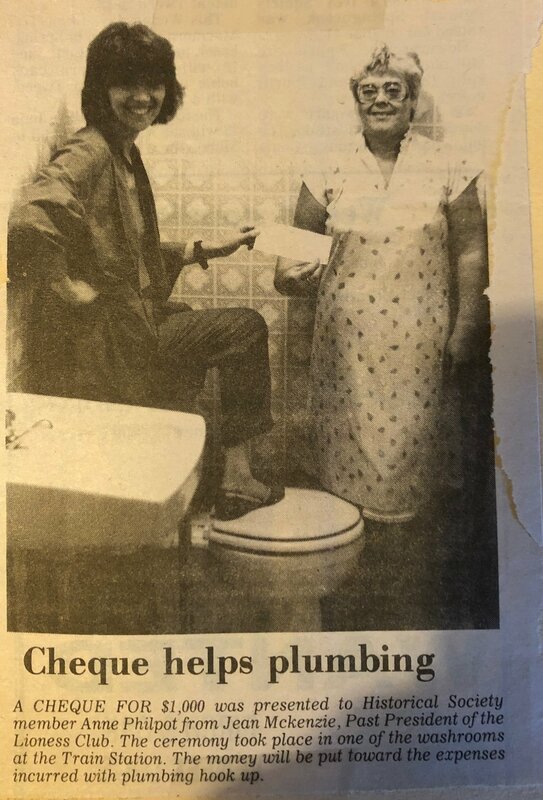 A $1,000.00 grant wasobtained to hire Brad Coens and Robert Spanbauer to locate it, level it and stabilize it for winter, The following year, another grant was obtained to start the process of restoration and the addition of two washrooms. By the end of the summer of 1986, it was ready for visitors. In 1995, after debate on council, it was decided to move the station to its third location, out of the view of the Dr. Parkin Living Centre. The station was moved closer to the highway and turned to face east - on the other side of the imaginary Cordova track. Here it acted as a tourist information centre and summer recreation centre. The plaque affixed to the side of Marmora's handsome old railway station gives but a glimpse of its lengthy history. Built in 1884, it remained for nearly 100 years on the line of the Central Ontario Railway at a spot two miles east of town. "After the line was abandoned, the station was moved here as a reminder of a bygone era when villagers could hear the whistles of more than 24 trains every day. Near this location, a spur line ran north to the lumber mills at Marmora Dam and on to the Cordova Gold Mines. In 1923 this little line had as its president Sir Henry Worth Thornton who was to be the first President of the CNR." Below: Believe it or not - LOCATION #4 The Station moves again to south of the #7 highway, to make room for the new tourist information building, this time at right angles to the Cameron Street, the original corridor of the Cordova spur line. 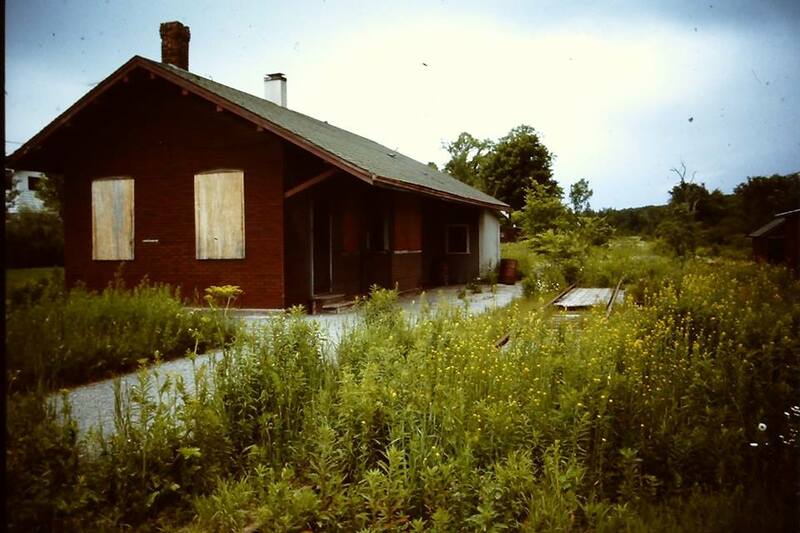 "Marmora Station is one of 11 Central Ontario Railway stations to have survived, either abandoned or put into modem day use as a residence, business, gallery,museum,restaurant or tourist information centre. It stands a proud memorial to the area's colourful and varied past." writes Judy Backus. Before the end of the age of trains, Marmora was surrounded by three railways - Canadian National to Maynooth, Canadian Pacific crossing east-west through Tiffen, and the CN Spur line that passed up Cameron Street and through town up to Cordova. BUT DID YOU KNOW that the intersection of the Cordova spur line and the Maynooth line, just south of Marmora on Highway #14, was known as BELMAR JUNCTION. Lew Barker remembers: " When I was a kid the engineer stoped the train and giving us a ride up to the old planing mill near number 7 Hwy. " Going south, the CN and the CP lines intersected at Bonarlaw. Another spur line, the Bay of Quinte Railway, owned by the Rathbun Lumber Co., joined Bannockburn & Queensborough to Harrowsmith, and on to Napanee, a total of 83 miles.